Talk about the baseball-themed anime series (also known as "Daiya no Ace" in Japan) here. Plot Summary: Eijun Sawamura is a pitcher who joins an elite school with a brilliant catcher named Kazuya Miyuki. Together with the rest of the team, they strive for Japan's storied Koushien championships through hard work and determination. Season Finale week na! Daiya no Ace S1 ends this Friday (05/04/18). The "Ace of Diamond All-Star Game III" event at Tokyo's Jingu Stadium on Sunday revealed that Yūji Terajima's Ace of Diamond Act II (Daiya no A Act II) sequel manga is inspiring a television anime that will premiere in 2019. This year's 52nd issue of Kodansha's Weekly Shōnen Magazine will reveal more details about the anime on Wednesday. Voice actor Ryota Ohsaka, the voice of the lead character Eijun Sawamura in the anime, stated at an event in February, "The anime is not over! It will continue for sure." The 14th compiled volume of Ace of Diamond Act II then teased on November 16 that the Sunday event would have a big announcement. Terajima's original Ace of Diamond baseball manga inspired a television anime that premiered in 2013, and Crunchyroll streamed the 75-episode series as it aired in Japan. 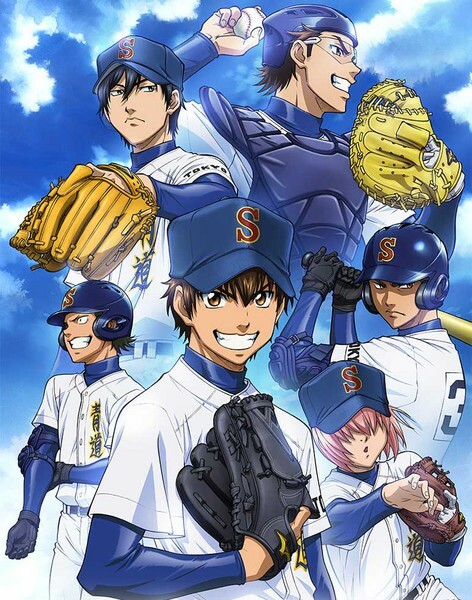 Ace of Diamond: Second Season premiered in April 2015, and Crunchyroll also streamed the 51-episode series as it aired. Terajima launched the manga in Kodansha's Weekly Shōnen Magazine in 2006. He ended the first part of the manga in January 2015, and Kodansha published 47 volumes for the manga. Terajima then launched Ace of Diamond Act II in August 2015. The fourth and fifth manga volumes bundled anime DVDs in 2016. The manga won the shōnen category of the 34th Kodansha Manga Awards in 2010. Kodansha Comics began releasing the manga digitally in English in March 2017. The manga has also inspired a series of stage plays, and the fifth stage play premiered in September 2017. Replay of Season 1 starts this Monday (December 3) in the same timeslot (6:00pm to 7:00pm) sa YeY!.